Vacuum Bottles There are 27 products. Classic 650ml double wall vacuum insulated stainless steel drink bottle which will keep drinks cold for 24 hours or hot for up to 12 hours. It offers the choice of three lid styles and is nicely presented in a black gift box. Handwashing is recommended and it laser engraves to a stainless steel finish. Double Wall Copper Coated Stainless-steel vacuum thermo bottle with a threaded insulated lid. Keeps drinks cold 24 hours or hot up to 12 hours. The copper plated outer wall makes a difference of 5C over 24 hours and prevents heat from entering or exiting the bottle by thermal radiation. 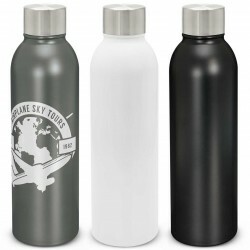 Non-toxic, non-leaching, BPA free. Fits in cupholder. Trendy 500ml double wall, vacuum insulated stainless steel drink bottle with a timeless design. It will keep drinks cold for 24 hours or hot for up to 12 hours. Mirage laser engraves to a stainless steel finish and is presented in a black gift box. Handwashing is recommended. 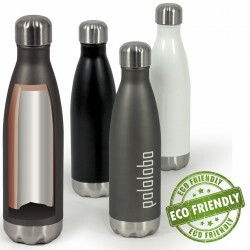 Classy 500ml double wall vacuum insulated stainless steel drink bottle with a woven carry strap. It has a secure screw on lid which features a spring loaded cover with push button activation that protects and seals a food grade silicone drinking straw. Midas offers exceptional performance and will keep drinks cold for 24 hours or hot for up to 12 hours. Impressive 650ml double wall vacuum insulated stainless steel drink bottle which will keep drinks cold for 24 hours or hot for up to 12 hours. It has a trendy screw on lid with a stainless steel carry handle and a bamboo veneer that offers a prominent branding opportunity. Handwashing is recommended. Trendy 500ml double wall, vacuum insulated stainless steel drink bottle with a stunning imitation wood grain finish. It has a secure screw on lid and will keep drinks cold for 24 hours or hot for up to 12 hours. Mirage laser engraves to a stainless steel finish and is presented in a black gift box. It is BPA free and handwashing is recommended. Stylish 500ml double wall, vacuum insulated stainless steel drink bottle with a gently curving design that is extremely comfortable to hold. It offers exceptional performance and will keep drinks cold for 24 hours or hot for up to 12 hours. Zircon has a secure stainless steel lid and is presented in a black gift box.